Learn English through discussing interesting topics with fellow visitors, or give a speech yourself and improve your oral English! Have fellowship with native English speakers and make new friends in this great atmosphere. 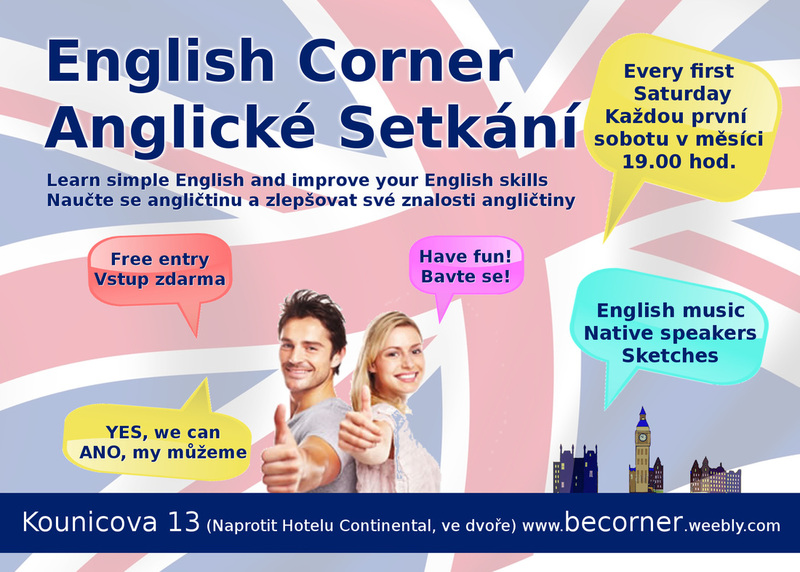 Every English corner activity is totally free of charge! Every month we have different topics to discuss. We give seminars for young and old. Discuss the matters of life. All is translated in Czech, so you can follow everything! Very often we have special activities, such as live concerts and inspirational movies. Great for the whole family and have fun spending quality time. You will make new friends and meet nice people. Every first Saturday of the month from 19:00 to 20:00 at Kounicova 13.